we strive to meet the needs of each bride. For a truly coordinated day from start to finish we will advise you on table arrangements and larger displays that will complement you theme perfectly. Posy - A small simple bouquet hand tied with ribbon - whilst this is perfectly acceptable for bridal flowers it is more commonly reserved for the bridesmaids. This type of bouquet is the perfect accompaniment for a simple, elegant, modern gown. If this is your gown of choice it is also worth considering carrying a single bloom for a chic minimalist finish. 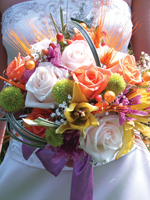 Round - This is the most popular choice of bouquet. It usually consists of larger flowers loosely arranged into a ball shape. It is common for florists to add to the finished look of this particular style by inserting wired pearl beads or diamante. This type of bouquet works best with an A-line/ full skirted gown. Shower - A traditional and more formal floral bouquet. It is inspired by waterfalls and as such consists of wired flowers that cascade from the hands toward the floor. This style of bouquet was designed for an empire line dress or fitted gown. 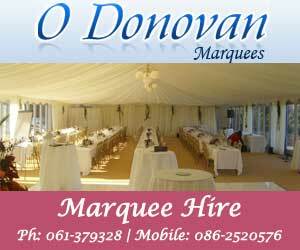 "Wedding Flowers Derry, Bridal Flower Packages Northern Ireland, Bespoke Wedding Flowers Ireland, Wedding Flowers Londonderry"